Tallahassee, Fla. – March 26, 2018 – FINLEY Engineering Group (FINLEY) has some exciting upcoming projects in progress, including the Construction Management/General Contractor (CMGC) rehabilitation of the TH 65 (3rd Avenue) Bridge, located in Minneapolis, over the Mississippi River. 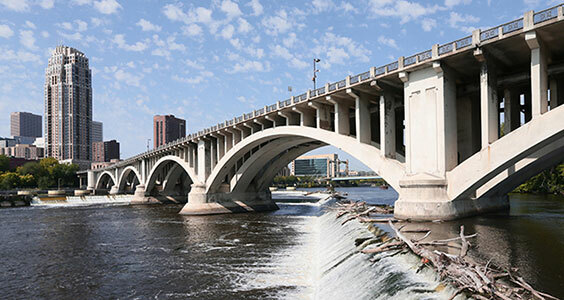 Originally constructed between 1915 and 1918, the 3rd Avenue Bridge is one of the Minneapolis Department of Transportation’s (MnDOT) 24 bridges selected for long-term preservation. The 3rd Avenue Bridge holds a significant title as the last major reinforced-concrete Melan arch bridge constructed in the Twin Cities and is a contributing element to the St. Anthony Falls Industrial Historic District; taking this into consideration, a main goal of this project is to preserve the historic features of the bridge during reconstruction. It has undergone two rehabilitations, occurring in 1939 and 1979 respectively. The bridge was built with a curved “S” shaped alignment to avoid failures of limestone bedrock that occurred between 1869 and 1875. In 1979, the bridge underwent one major concrete repair project, followed by a joint replacement project in 2004. Although many updates were made during its last major restoration, the 3rd Avenue Bridge has been in service for nearly four decades since its last repair. As a result, its condition has greatly deteriorated, showing clear signs of compromised structural integrity and safety issues for the public. FINLEY is Ames’ construction engineer for the 3rd Avenue Bridge Rehabilitation Project. Previously, together they have successfully completed the I-90 Dresbach Bridge and the TH 43 Winona Bridge. “[Ames] is very excited to have FINLEY’s experienced team of engineers working with us as [Ames’] construction engineering specialist,” stated Jerry Volz, Ames Vice President of Bridges and Structures. MnDot’s plans include re-decking and rehabilitating the bridge to achieve a 50-year design life. During reconstruction, the main goals for this project are to minimize the impacts on the local community and the environment while reducing the closure of this important artery of downtown Minneapolis. There will also be barriers, railings and lighting added to the bridge, as well as minor grading at the bridge approaches. Construction of the bridge is anticipated to begin in the fall of 2019. The project is expected to be completed in approximately three years. To learn more about FINLEY’s upcoming projects, visit www.finleyengineeringgroup.com. FINLEY is recognized nationally and internationally as a leading design and construction engineering consulting firm specializing in complex bridge projects of all kinds. FINLEY’s expertise includes concrete segmental, steel box, arches and trusses, and long span cable-stayed bridges. FINLEY focuses on large Contractor-driven projects, such as design-build, D/B/F/O/M, Public-Private Partnership (P3) and value engineering/alternative design.